Here we are; the home stretch! In the end, after editing out some errors and tightening up the timing between the paragraphs, the audio version has clocked in at 7 hours and 17 minutes. I’ve listened through word by word and made some minor tweaks to the audio and the text to help them line up a little better, especially around the page marks. It’s not perfect, there’s some stuff I’d like to rework later, but I think it’s ready to be seen and heard. TOBI includes a few different options for DAISY output. The most important choice is the format for the audio files. Higher quality files mean a cleaner sound but the book takes up more space, meaning longer download times. Because the audio is just spoken word, I choose to set the sample rate a 22,500 Hz. The reasoning behind this has to do with the Nyquist frequency and physics but suffice to say that the range of the human voice sits pretty well in this frequency band. In fact it’s the sample rate used for AM radio. After setting my MP3 encoding bit rate to 128, a mid-level quality the end result is a DAISY project folder about 200 megabytes in size. To test the project I used Amis, a free and open source DAISY book player. Here’s a screenshot of Amis in action. As the audio plays the highlighting tracks along, paragraph by paragraph. Tears of a Machine is a digital talking book! Converting the files across formats is a quick, painless process using the client for DAISY Pipeline, another free application. This program uses a web interface to load files from one digital talking book format and translate them to another. A few clicks and a little fussing with the output files and it’s done. I now have a synchronized text ePub book. I chose to go a few steps further however. The simple conversion to ePub creates a rather bare-bones file with minimal text formatting and no cover image. 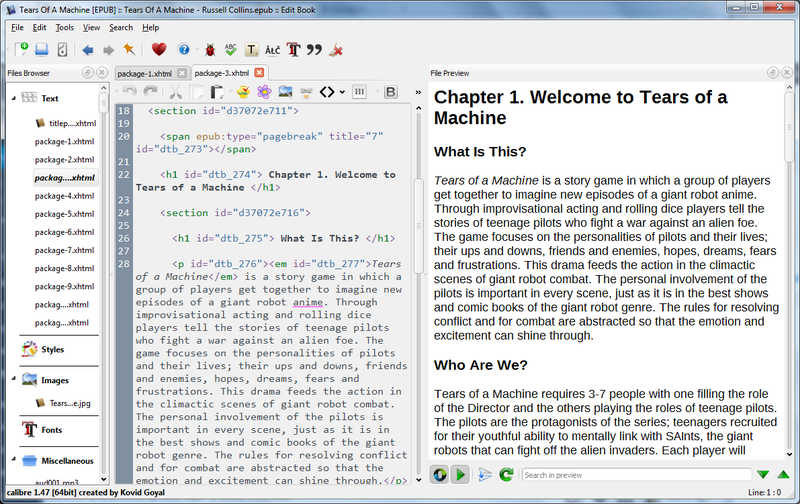 With Calibre eBook management software I can go under the hood with the ePub files and modify the code. Because I want to enforce the importance of accessibility I use some style code to enforce a sans-serif font as the default. I also reattached the cover image so that it will stand out in an eBook library full of book covers. Remember your HTML and you’ll be fine. It would have been a smoother road had I taken the other approach, starting from the more complex ePub and stripping away the frills to get the DAISY version. The end result of the conversion is a 200 megabyte ePub book. Huge compared to what you may be used to from other ePub books but this one includes the synchronized audio for the entire book in one neat package. To test the ePub file I need ePub reader software that can handle the media rich ePub 3 format. Fortunately there’s a free and easy to use application that does the job. A Google Chrome extension called Readium. After adding it to my Chrome browser I can upload local files or link to an online ePub book and it’s added to a bookshelf connected to my Google account. Then I just press play and read along with the recorded narration. Now you can hear and see the results for yourself! The ePub and DAISY versions of Tears of a Machine are both available, free of charge by following the links below. Remember to equip yourself with the right playback software for your format of choice. 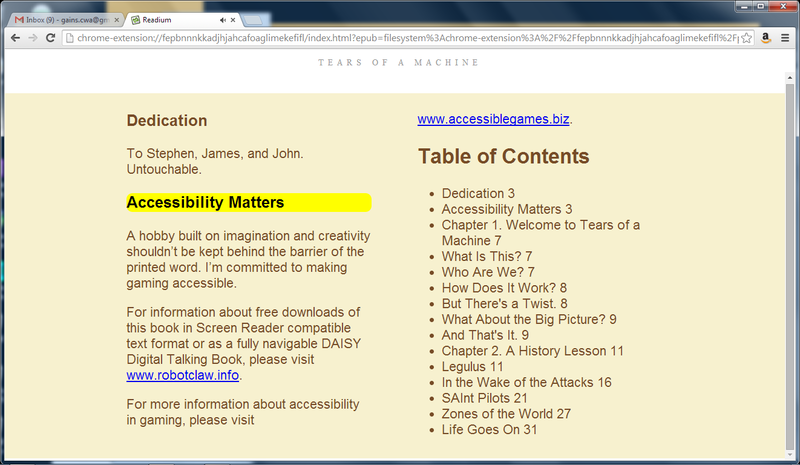 Download the ePub with this link: Tears of a Machine ePub. You’ll need software or hardware with support for ePub 3 rich media files, like Readium. You can still read the text with other software but you will not have audio playback synchronized to the text. Download the DAISY files with this link: Tears of a Machine DAISY. Unzip the files and add them to your DAISY library. You’ll need DAISY playback software or hardware to get the synchronized audio playback while reading. Try Amis for a free option. 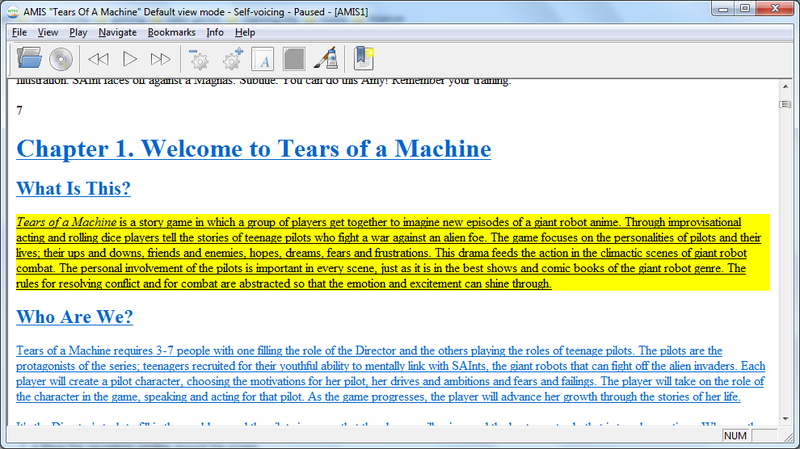 Please give me your feedback on the digital talking book version of Tears of a Machine. Was it easy to use? Is the audio quality okay? How about the text display? I learned a lot from creating this game and its accessible audio book. I hope that I can use that knowledge to make tabletop games more accessible; my designs and the work of other developers. If you want to support my efforts, go to DriveThruRPG and buy a few copies of Tears of a Machine for yourself and your friends. Play the game and have fun! May the SAInts preserve us.